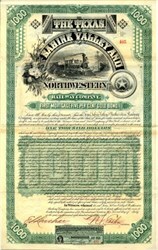 Beautifully engraved $1000 Gold Bond Certificate from the Texas, Sabine Valley Railway and Northwestern Railway Company issued in 1888. This historic document was printed by the American Banknote Company and has an ornate border around it with a vignette of an old train next to telegraph lines. This item has the signatures of the Company�s President and Secretary, and is over 122 years old. Light pen cancelled. 88 coupons attached. 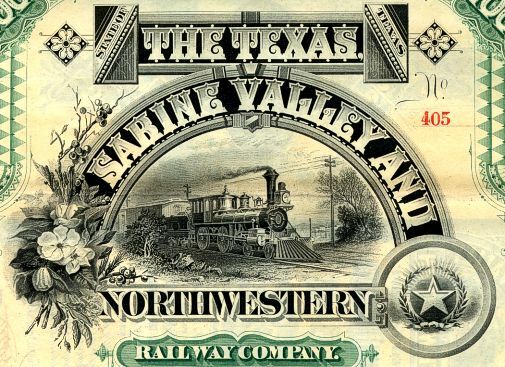 The Texas, Sabine Valley and Northwestern Railway Company was chartered on October 3, 1887. The railroad was planned to connect Longview with Sabine Lake in Jefferson County and with some point in Lamar County. The railroad had a capital stock of $1,000,000. The principal place of business was in Longview. The members of the first board of directors were George D. Harrison, James M. Mobberly (Moberly), Richard J. T. Vans, and Andrew Taylor, all of Longview; Thomas Hull of Carthage; Charles M. Whitney of New Orleans; and Nelson L. Easton and Frank M. Lanchar, both of New York City. Lanchar owned most of the shares in the railroad. In 1888 the railroad acquired twenty-one miles of the Galveston, Sabine and St. Louis Railway Company running between Longview and Martins Creek and constructed fifteen miles between Martins Creek and Carthage. On September 20, 1893 the company was placed in the hands of a receiver and sold under foreclosure on June 7, 1897, to D. D. Durham, G. T. Merrill, F. T. Rembert, and the Grigsby Construction Company, who reconveyed the property to the TSV&N. In 1903 the TSV&N owned four locomotives and twenty cars and reported passenger earnings of $28,000 and freight earnings of $122,000. The company operated the Texas and Sabine Valley Railway running from Carthage to Boren, 2.2 miles, from 1893 to December 26, 1904. It also leased the Marshall, Timpson and Sabine Pass Railroad operating between Carthage and Timpson, 19.1 miles, from 1901 to December 26, 1904. On December 27, 1904, the TSV&N was sold to the Texas and Gulf Railway Company. History from the Handbook of Texas Online.